Adjust toaster oven cooking rack to the bottom position and preheat to 350 degrees F. Lightly oil a baking dish or cookie sheet. Halve pear and use a teaspoon to scoop out the seeds. If the halves do not lay flat, slice a thin piece off the back. 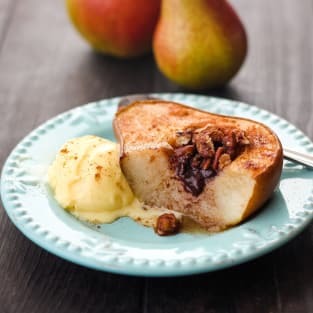 Place pear halves in the baking dish and sprinkle with cinnamon, fill with chocolate chips and pecan pieces. Drizzle maple syrup over both halves. Bake until pears soften about 25 to 35 minutes. The bake time will vary depending on the variety and ripeness of the pear used. Serve warm topped with vanilla ice cream or yogurt. To cook in a convection toaster oven reduce the temperature to 325°F and bake pears until softened, about 18 to 25 minutes.